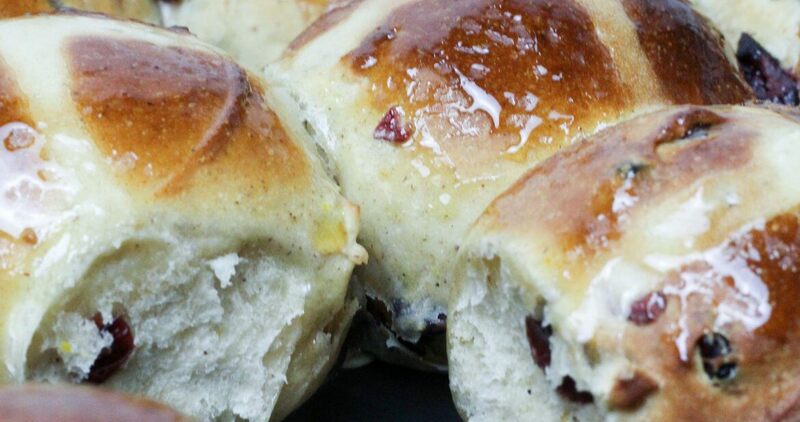 One of my great childhood Easter memories was walking down to the bakers at the end of the road with my Dad on Good Friday morning to pick up some freshly baked hot cross buns for breakfast. The heady smell of freshly baked buns rich with spices and fruit still makes me dribble. Imagine my horror this year when I heard there was a raisin shortage. Luckily I am not a traditionalist so I made a delicious tweak on my normal Hot Cross Bun recipe. A lovely combination of cranberry and orange zest for those who like me are not a big fan of the peel in a standard hot cross bun. My house now smells like that bakers every weekend on the run up to Easter, as I think hot cross buns should not be a one day affair. Delicious warm from the oven or toasted slathered in butter. Add the milk and butter to a small saucepan and gently warm until the butter melts. Remove from the heat and allow to cool for 15 minutes. Then beat in the egg. Put the flour, sugar and spices into a large bowl and mix together. Add the salt and yeast, on opposite sides of the bowl. Finely zest the orange and lemon and add to the dry ingredients. You can do the next step by hand or in a stand mixer. Add about 90 percent of the liquid into the bowl of dry ingredients and bring together with your hand until you incorporate all of the flour. You want a soft dough so add more milk if needed. Tip the dough out on to a lightly floured work surface. Knead by hand for 5 minutes. If the dough still seems too sticky and is not forming a soft ball, add a little flour. Add the cranberries and knead for another 5 minutes. If using a stand mixer, mix with a dough hook for 5 minutes,then add the cranberries and mix for another minute or two. Oil a large bowl. Place the dough in a bowl and cover with cling film. Leave to rest in a warm place for about 1-1½ hours or until doubled in size. Turn the dough out on to a lightly floured surface and divide into 12 equal size balls. Roll the balls on the counter until they look nice, round and tight. Line a large baking tray with baking parchment and place the balls on the tray, placing them fairly close together. Put the baking tray into a large clean polythene bag (bin bags work well). Puff up the bag so it doesn’t touch the buns. Leave for 1 hour or until the buns have doubled in size. When the buns have doubled in size, preheat the oven to 220C/200C Fan/Gas 7. Whisk together the flour in a bowl with 100ml water until it forms a smooth paste and then pour into the icing bag. Pipe a cross onto each bun. I normally do a line down each row, then a line across each row, rather than doing each bun individually. Bake for 16-20 minutes until pale golden-brown. Turn the baking tray around halfway through for an even colour. When the buns come out of the oven, brush with a little maple syrup, before cooling on a wire rack. 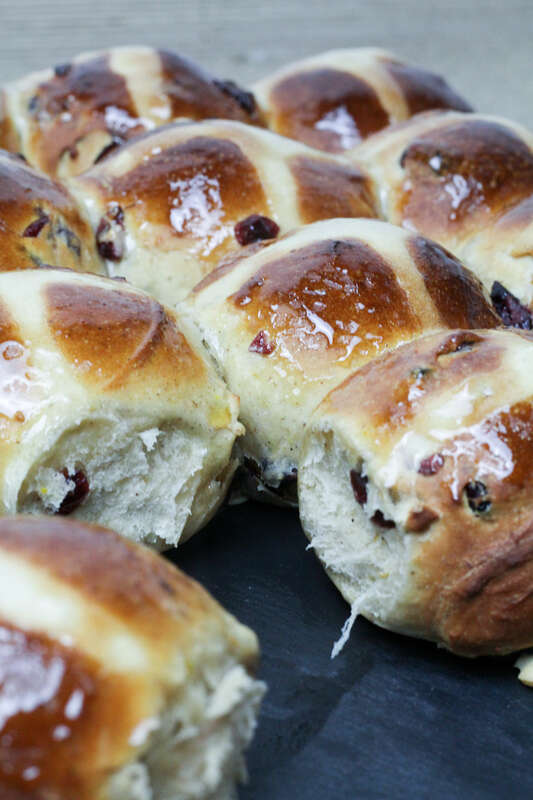 One of my great childhood Easter memories was walking down to the bakers at the end of the road with my Dad on Good Friday morning to pick up some freshly baked hot cross buns for breakfast. The heady smell of freshly baked buns rich with spices and fruit still makes me dribble. These will fill your house with that same delicious smell.